THE SIGNIFICANT CONTRIBUTION that Irish women made during World War 1 is highlighted in a new exhibition. It shows how thousands of Irish women worked in bomb making factories here in Ireland. Five ‘national munitions factories’ were set up in Dublin, Cork, Waterford and Galway – employing around 2,000 women. The exhibition examines how Irish men and women were involved in the war by looking at the stories of 21 individuals who took part. One of those women was Florence Lea – a dressmaker’s apprentice who had been earning a paltry two shillings a week before the war started. Senior historian with the National Museum Lar Joye curated the World War 1 exhibition. He told TheJournal.ie that the war offered Florence an amazing chance to improve her economic situation. About 1,400 women worked making bombs in Dublin. The exterior of the National Shell Factory at Parkgate Street, Dublin, during the First World War. Female workers queue outside the National Shell Factory at Parkgate Street, Dublin, during the First World War. The operators in the National Shell Factory at Parkgate Street, Dublin, during the First World War. Note the factory motto painted onto the wall. Female workers adjust the nozzles of shells in the National Shell Factory at Parkgate Street, Dublin, during the First World War. Kathleen Nolan sharpens a tool on a grindstone a the National Shell Factory at Parkgate Street, Dublin, during the First World War. Kathleen Nolan presses a driving band onto a shell in the National Shell Factory at Parkgate Street, Dublin, during the First World War. Interior of the National Shell Factory at Parkgate Street, Dublin, during the First World War. Note the board showing the number of shells passed into bond totals per shift on the back wall. Women sit at benches in the canteen at the National Shell Factory at Parkgate Street, Dublin, during the First World War. A gramophone can be seen on the left. It was dangerous work and in September of 1917 a factory in Arklow blew up and killed 27 people. The plant manufactured 100 tons of cordite every week and had a workforce of over 2,000. It happened at 4 o’clock in the morning- had it happened at 4 o’clock in the afternoon it could have killed hundreds. 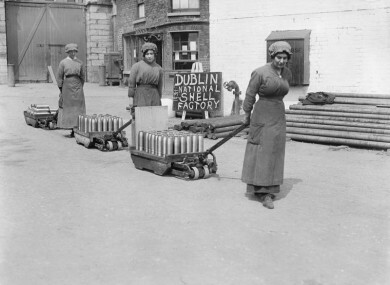 By the summer of 1919 the national shell factories were sold and the majority of Irish women – including Florence – returned to more traditional workplaces and trades. Recovered Voices – Stories of the Irish at War 1914 – 1915, opened at the National Museum of Ireland this week. Email “In photos: The Irish women who made bombs during World War 1 ”. Feedback on “In photos: The Irish women who made bombs during World War 1 ”.